By motor vehicle – 5 hours from Vancouver and 6.5 hours from Calgary. By plane – 1.5 hour drive from Kelowna International Airport (serviced by WestJet, Air Canada, and Horizon Air). Located in the Shuswap, the heart of beautiful British Columbia, Salmon Arm is conveniently located on the Trans Canada Highway halfway between Calgary and Vancouver, and is nestled on the shores of one of the largest most pristine lake systems in British Columbia, Canada. Shuswap Lake has over 700 km. of shoreline with plenty of sandy beaches for recreation and relaxation. Outstanding natural beauty, clean waterways, provincial parks and an abundance of green space surround this world-famous recreation area. 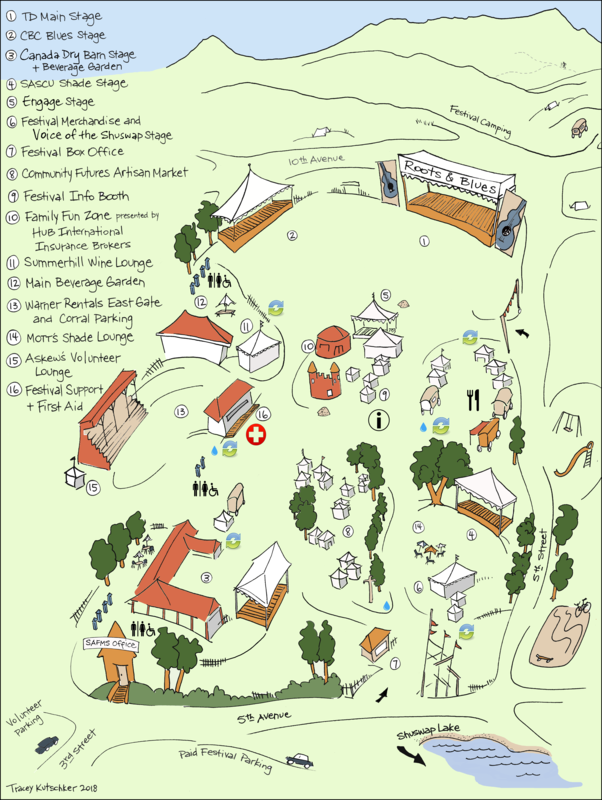 The Salmon Arm ROOTSandBLUES Festival is held at the Salmon Arm Fair Grounds-- 17 beautiful acres with Mount Ida and the Fly Hills providing a scenic background. We are one block off the Trans Canada Highway in the centre of Salmon Arm.